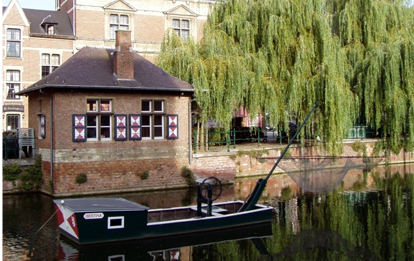 Records of eel fishing in Lier date back to 1890, but it is presumed that the first fishermen took to the water generations before that, especially the people from the poorest stratum. They fished with rugged barges on the river Nete and caught eel out of necessity. Around 1900 over 35 flatboats with fishermen using nets to catch their loads navigated on the waters south of Lier. In 1932 thirty eel fishermen united as a group to better defend their interests. The eel fishing or eel-rolling was a practice typical for the town of 'Pallieter' (well-known fictional character out of Lier's most famous novelist Felix Timmermans), because the barges were unique in the country. They had no engine or sails, and were only moved by the current. The Nete in Lier is heavily subjected to tidal influences, so the water runs downstream for about nine hours and then 2-3 hours upstream. By those currents the fisherman drifted their boats to the fishing spots and later on back home. From the fishing boat a square net was lowered to the bottom of the Nete while the boat was anchored. Due to the current the net would tilt into a sideway angle. Those eels still swimming with the current would swim right into the fishermen's nets. These nets would then be retrieved every 5 minutes using a pulley, hence the name "eel-rollers". In 1974, however, eel-rolling was prohibited thus forcing the Brave Boat Fishermen to abandon their hobby and long-standing tradition. 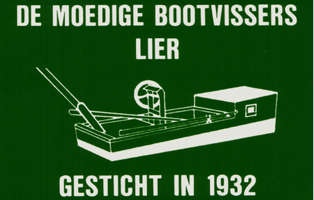 Since 1979 the Brave Boat Fishermen organize tourist boat trips on the Little Nete in the centre of Lier. The inhabitants of Lier also call this part of the Nete the "Binnennete", because it is standing water in the heart of the city. Nowadays, the barges used are flat bottoms without the superstructure and with an outboard motor. In 1982 the company obtained the title "Royal" in honor of their fiftieth anniversary. A boat trip on the Binnennete is a unique experience you cannot afford to miss!